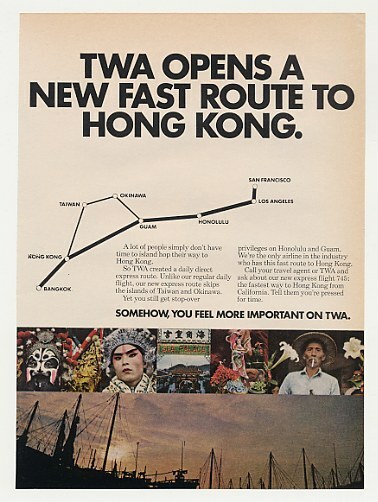 In 1970, my maternal grandparents were delighted when this ‘new fast route’ opened to Hong Kong. (From the mid-60s to the early 80s, they visited Hong Kong 8 times.) They were always jetting off to some place far from their home in Elgin, Illinois: Hong Kong, Bora Bora, Nairobi, Istanbul. If they had a time limit, it was London or Paris. When my Ohio-born grandfather proposed to my grandmother, a native of Connecticut, he promised her a life of adventure and certainly didn’t disappoint. After their oldest son took a job with TWA, traveling became a lot cheaper as parents of employees enjoyed unlimited passes back then. 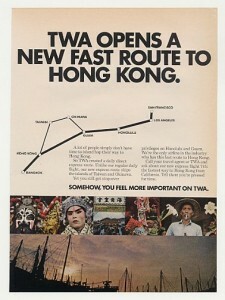 And lucky for them, TWA flew to quite a few places. As their only granddaughter for many years, I was the willing recipient of silk slippers, Chinese jackets, African dolls, Hawaiian outfits, and countless postcards. It was from my mom’s side that I developed my wanderlust, especially to places off the beaten path. I remember eating Cuban sandwiches with my grandfather in Key West when I was 11, looking to the south as he told me about the time he took his mother (my namesake) to Havana. He had always wanted to visit China, but the closest he got was Hong Kong and Macao. I recently found a postcard he sent to his mother from “Free China” (Taiwan) the time he and my grandma met my mom in Taipei in the mid-60s. When the People’s Republic opened to Americans, my grandfather was getting up there in years and was no longer able to rough it. I like to think I followed in his footsteps and blazed a few trails myself.